It’s great to know about off-the-beaten-track eating spots, particularly when they are accessed from roads you’ve driven multiple times but never knew to deviate from. Towerbosch Earth Kitchen restaurant at Knorhoek wine estate in Stellenbosch is that sort of place. I’m really glad to have made a new discovery, visiting recently after hearing positive reports. Towerbosch is accessed at the end of a scenic winding drive by car, then on foot along a path to expansive lawns, jungle gyms and an impressive backdrop of trees. 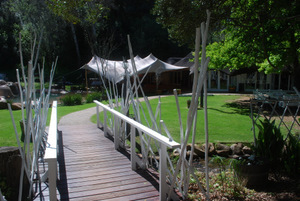 It’s here that families eat and drink at bare white tables under leafy trees. The indoor space is cluttered with brick a brac, antiques and modern furniture. Design consultant Neil Stemmet’s fantastical chandeliers are constructed from vintage trinkets. On Sundays a water feature becomes an impromptu kiddies’ swimming space and there is a lazy, happy mood. Towerbosch is known for its Sunday asado, a set lunch that successfully combines Argentina’s speciality with some South African recipe favourites. Thanks to the classic training of chefs Westley Müller and Carmen van der Merwe, the menu moves beyond boerekos, but retains a nostalgic sense of eating granny’s food. 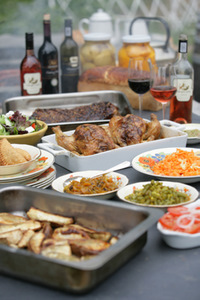 The asado set menus combine a few plated items and plenty of shared platters. Think homemade bread, farm butter and preserves, followed by Argentinean-style empanadas. Starters typically include smoorsnoek rice, before moving on to meat in a big way. Slow-roasted beef or lamb or pork cooked to perfection, plus fat, 250g-slabs of aged Chalmar beef sirloin finished on the braai. Roasted veggies and traditional South African accompaniments, plus contemporary salads with say, beetroot and feta. Malva puddings, apple bakes or sweets along those lines finish the meal, plus a hot beverage. On weekdays it’s really quiet, hence the menu at Towerbosch is a la carte. Bread, butter and preserves again introduce the meal, and the small menu focuses on flavourful dishes reliant on a few quality ingredients. Venison Carpaccio with red-wine-poached pears, Gorgonzola and rocket. Crispy lamb empanadas with a side salad, or beetroot salad with crumbed goats cheese. Heartier options such as grilled fish with a butter and burnt garlic sauce partner a sliced potato bake. 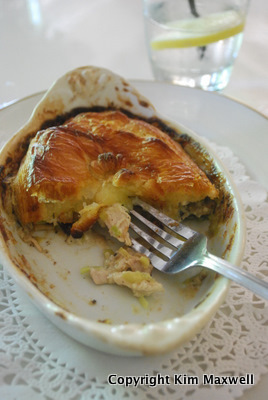 A comforting free-range chicken pie, roasted and baked with an oval lid of sour cream puff pastry. A ‘plaasbord’ designed for two is a lighter option, with a selection of charcuterie – home-cured when available – local cheeses, homemade pickles and farm bread. Knorhoek and Two Cubs wines by the glass and bottle are very affordably priced.